Established in 1985, Chemical Consultants Inc., is the pioneer in formulating and manufacturing of compliance chemicals for the screen-printing industry. CCI has further expanded its expertise by manufacturing premium emulsions for any application. In addition to the extensive and still growing product line, CCI continues to lead the industry in automated screen cleaning and reclaiming equipment that offer advanced features and user friendly functions. NSDS is committed to green business practice, and with this in mind we are proud to partner with CCI in catering to the ever demanding needs of the industry. Gem-zyme is designed for removal of all photo polymer, diazo, and capillary film emulsions. Gem-zyme will immediately liquify and break down the emulsion and dramatically increase the speed of the reclaim procedure. CDR Concentrate is a biodegradable concentrated decoating agent, when in dilution form will quickly and economically remove all types of photo-polymer, diazo, or capillary film on all types of mesh. CCI Miracle Wash is Environmentally friendly water soluble Ink Degradent and Emulsion Remover. It is a highly effective Screen Wash on plastisol, solvent based and UV inks, and will quickly remove all types of Photo-polymer, Diazo or Capillary film on all types of mesh. This makes it much easier when complete reclamation of the screen is necessary. LSR-30 is a semi-viscous ghost/image stain remover that is designed for a variety of inks. This product cleans mesh of stains with less noticeable odour and works better than most paste stain removers. LSR-30 contains Sodium Hydroxide, refer to the Material Safety Data Sheet for safety and handling practices. complete reclamation of the screen is necessary. 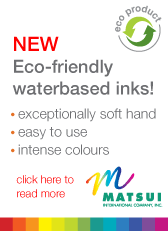 Press Wash LV immediately liquifies the ink and dries quickly, leaves no film or oily residue.